The aunt of a 14-month-old has told a jury the toddler was murdered by her own mother. Shagufta Yasmin, 45, was giving evidence for a second day at the High Court in Glasgow where her sister-in-law, Sadia Ahmed, 28, is on trial. 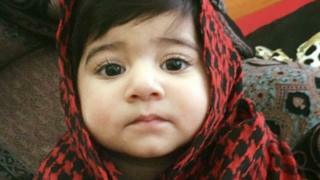 Ms Yasmin, who was filmed feeding her niece milk using a syringe, said: "Inaya did not choke on bread. She was killed and Sadia killed her." Ms Ahmed denies murdering her daughter in Glasgow last April. She is also accused of assaulting Inaya on various occasions between 12 February, 2015, and 16 April last year, by force feeding her bottles and syringes containing milk. Earlier, the jury was shown a video of Inaya being fed with a syringe by Ms Yasmin, surrounded by members of her family. As the footage was screened both the witness and the accused broke down in tears. Defence QC Ian Duguid said: "On one occasion when she is flat on her back you used a syringe to inject milk in her mouth." Ms Yasmin responded: "I was just trying to feed her." Mr Duguid said: "You said yesterday Sadia didn't want a girl, but she comes from a family of five sisters and two brothers is that right?" Asked if it was Ms Ahemd's mother-in-law, Noor Ahmed, and her husband, Suleman, who did not want a girl as opposed to the accused, Ms Yasim replied: "No that's not true. They liked Inaya better than a boy." Ms Yasmin claimed Ms Ahmed was unhappy when an ultrasound scan revealed the child she was carrying was a girl and added: "Sadia said she wanted an abortion." "She was the one happy having a girl and it was the family and Noor and Suleman, in particular, who were not happy." Mrs Yasmin replied: "She was sure she was going to have a boy. She is lying. The family were all happy." When it was put to the witness that Noor Ahemd threw away the scan photograph Mrs Yasmin replied: "This is a lie." The jury also heard Ms Yasmin gave Inaya, who had feeding difficulties, bitesize pieces of bread or cucumber to hold in her hand. Mr Duguid said: "Is that not an incredibly dangerous thing to do?" She replied: "Yes, but I made sure, and so did everyone, that she did not put it in her mouth." Asked what would happen if the child put the cucumber in her mouth, Ms Yasmin replied: "Obviously if she put it in her mouth she could choke on it. "I never left her alone I kept one eye on her even when we finished eating. "I used to get the piece of bread and take it away from her." Mrs Yasmin told the jury that Inaya would ask for the food after seeing the other children being given it. The jury was told that the video of Inaya being fed using a syringe was taken when she was 13 or 14 months old. The trial before Lord Mathews continues.